Mary “Jane” Stephens, 92, of Topeka, passed away Sunday, January 27, 2019. She was born February 10, 1926, in Mattoon, Illinois, the daughter of Lester and Cleda (Henry) Wells. She received a High School Diploma from Rosedale High School in Kansas City, KS in 1943. Jane married S. K. Stephens on July 14, 1945 in San Francisco, CA; he preceded her in death on March 4, 2010. Survivors include three children: Talisa McClain, Janet Paduh and Robert E. Stephens; grandchildren, Stephanie A. (John) Hughes and Greg (Lisa) Wright, great-grandchildren, Taylor (Cody) McKaig, Talisa Hughes, Tateum Hughes, Harper Wright, and Hunter Wright; great-great-grandson, Carson McKaig. She was preceded in death by her son-in-laws, Ronald E. Paduh and Roy R. McClain; brother, Robert Wells. Jane was an accomplished watercolor artist—known for her charming portrayal of birds and serene landscapes. 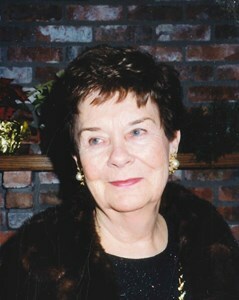 She and her daughter Janet enjoyed painting and participating in many art events throughout the years. She was a past member of Topeka Art Guild. She was an avid and competitive contract bridge player, and enjoyed playing golf and Scrabble. Jane and S.K. were members of Shawnee Country Club where they enjoyed golf, dancing and an active social life. They celebrated their 50th wedding anniversary at Shawnee Country Club, and had 65 years of a loving marriage. Mom, they say there is a reason, but neither time nor reason, will change the way we feel, for no-one knows the heartache, that lies behind our smiles, no-one knows how many times, we have broken down and cried, we want to tell you something so there won’t be any doubt, you’re so wonderful to think of, but so hard to be without. Cremation is planned and no services are set at this time. The family would like to thank Brewster Place and the staff at the Health Center, along with Midland Hospice for their excellent care and love given to our mother. Memorial contributions may be made to Midland Care, 200 SW Frazier Circle Topeka, KS 66606, Helping Hands Humane Society, 5720 SW 21st Topeka, KS 66604-3720, Alzheimer's Association - Topeka 3625 SW 29th St. Suite 102 Topeka, KS 66614 or to Brewster Place 1205 SW 29th Topeka, KS 66611. Penwell-Gabel is assisting the family with arrangements. To leave a message for the family online, please click the "Share Memories" button above. Add your memories to the guest book of Mary Stephens. Jane has given numerous watercolor bird painting to my mother Pudgie Robb. After her death I inherited those paintings. I have them displayed throughout my house! I also enjoy the painting in the women’s restroom at Shawnee County Club # 13 with her friends named below each bird! Jane was very good friends of my stepmother, Fran White. They painted together, attended art exhibits, played bridge and golf together. Fran had some of Jane's paintings, in particular I remember some with birds. I always remember Jane as very nice, interested in others and a great friend to Fran. I'm sorry for your loss. Sadly, my father, Dean White passed away just days before Jane. The Stephens family has been a big part of my childhood memories. I love all of them, but will always have fond memories of Jane. I came into their lives at age eight and still remain best friends with their daughter, Janet. I will miss seeing and talking with Jane, she was a very special person in my book of memories.